*Concrete delivery and placement times will vary. Dates subject to change. 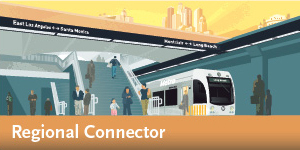 Regional Connector Constructors (RCC) will place concrete slabs at the Grand Av Arts/Bunker Hill Station to build the station’s concourse level, walls and sub-floors. This two year process will advance and be scheduled intermittently with installation of rebar, utilities and waterproofing to support the new station. Work activities are anticipated to continue intermittently on weekdays and Saturdays for approximately two years. Anticipated work hours, weather permitting, are 3 am to 3 pm. Activities include: Concrete pumping and placement within the station. First hour will be used for setup. This activity is the construction continuation of the station structure. Concrete will be pumped through 2020. Work will behind current k-rail closures. No additional closures needed. Trucks will stage on northbound Flower St and enter the site at 3rd St.
A northbound Flower St lane between 3rd St and 4th St will be restricted for truck staging. A flagger will be on site to assist with the trucks staging and entering the site.